Ultrasonic level sensor accuracy can be impacted by ambient temperature, humidity and the composition of the vapor phase above the liquid level. Ultrasonic level sensors require certain ports, such as a 2” NPT fitting, which a tank might not have or which is already being utilized by something else, like a fill line connection. Ultrasonic sensors require specific monitoring locations so that the sidewalls of the tank do not impact the cone beam pattern of the sensors. So, not only does the tank need the proper hole size, but it also must be in the correct location. Ultrasonic sensors need controllers to receive their signals, interpret their readings and send data to the cloud, and these controllers are often expensive. 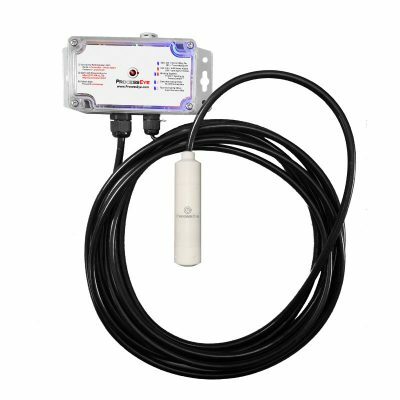 While our LevelEyeTM Tank Level Monitoring Program can utilize any level-sensing device with a 4-20mA output, our standard program utilizes submersible level transmitters. This eliminates the challenges encountered with ultrasonic level sensing and provides a more universal and accurate solution. Our RemoteLobesTM, which are mini-computers with WiFi capability, allow a user to connect easily via WiFi. No special software, cables, wiring, drivers, etc. are required. Each device is easily configured in a secured web browser. There is not a simpler installation or configuration process for tank level monitoring on the market. From the RemoteLobeTM, data begins to flow to our highly- secured web platform, called ProcessCentralTM, where the rest of the magic happens. Our back-end structure was built with scalability and flexibility in mind. The infrastructure enables our users to add values to over 30 different fields for each tank, thereby enabling easy reporting and analysis segmented by a wide variety of parameters to include things like personnel, application, product, warehouse source, geography, etc. We offer 4 standard sensor configurations to help meet most chemical compatibility concerns. The information for these standard options is contained below. Why is this better than ultrasonic? There has historically been 2 challenges with submersible level sensing for fluids other than water. The first is that they need a protected vent location (i.e. can't have dust and water getting into it) and the 2nd is consideration for chemical compatibility. We have eliminated these concerns with our LevelEye program. The benefits are that installation is incredibly simple. There is no need for special size ports or fittings and you don't have to worry about beam patterns coming into contact with obstructions or sidewalls that might render the reading inaccurate. There are no concerns of foam and for chemicals that might off-gas (which many do) there are no random or inaccurate readings due to the varying density of air in the head space of the tank. Click on one of the "SEE OFFERINGS" buttons above to see the details for that option. Please contact us for additional options that suite your application. Is there an on-going expense? We offer a free tier, where one reading per day is provided. Data frequencies as granular as 1x/minute can be provided with an additional monthly fee. We think you won't find a simpler installation. All a user needs to do is drop the sensor through a 1" or larger opening in the top of a tank and let it go to the bottom. Our standard S1 series submersible level transmitters have over 17' (5m) of cable, allowing for measurement in a wide variety of applications. Is there information available on chemical compatibility? We have extensive data available here. Also, for our robust PEFFKM-1026 seals we have additional chemical compatibility information here. What units can I record the tank level in? We provide many options from the user interface ranging from %, gal, L, bbl and others. 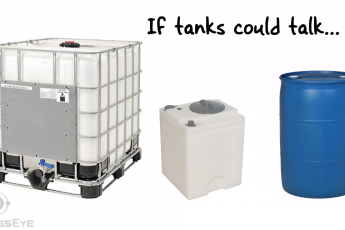 A user can configure the type of tank (i.e. square tank, vertical cylindrical, horizontal cylindrical) and its dimensions in the RemoteLobeTM via a cell phone and the RemoteLobe will do the rest. We use fact that a fluid exerts pressure that is proportional to the height of the liquid and the density of the fluid. As the level goes up, the pressure goes up and our RemoteLobesTM have logic in them that converts this to a level. Does the fluid density play a role? Yes it does. A user has to enter the specific gravity of the fluid from their phone so that we can use it in the calculations in the RemoteLobeTM. Does barometric pressure play a role? Not with a submersible level sensor. The cable actually has a vent tube in it that goes up into our RemoteLobesTM. Our RemoteLobesTM have a vent plug that allows the pressure to achieve the current barometric pressure, cancelling out any influence of changes in the atmospheric conditions. The ProcessEyeTM ecosystem uses standard WiFi, which enables the sensors and RemoteLobesTM to be dispersed throughout a facility. They can be granted access to a Guest-WiFi network, or a separate cellular modem with a hotspot can be used to gain access to the internet. Can I get an automatic report of the tank levels emailed to me? Absolutely. We have allowed users a robust reporting package in ProcessCentralTM that allows them to generate custom reports on a frequency that is desirable to them (i.e. daily, weekly, or monthly). Even more important, we provide the ability to share this information with users across an organization so that each area can get meaningful reports for their role. A sales representative might want a report for all his accounts, a sales manager, for their region, a manufacturing location for tanks that are supported by them, a logistics person for upcoming tanks, etc. We feel this is key for an organization to truly see value. Security is one of our key priorities and we use the most advanced encryption technology available to ensure secure communications. Can the values be brought into my DCS/SCADA/PLC? Our ecosystem uses a blend of computing logic that occurs in our RemoteLobesTM as well as ProcessCentralTM, so at this point we don't make the information available to be incorporated into existing infrastructure. We also believe that there isn't much value in bringing this data into existing infrastructure due to the cost, complexities and lack of automated reporting. Without the reporting capabilities the same "forgotten" condition will develop and users and organizations won't be any better off. Ultrasonic sensors require specific monitoring locations so that the sidewalls of the tank don’t impact the cone beam pattern of the sensors. So not only does the tank need the proper hole size, but it also must be in the correct location. Ultrasonic sensors need, often expensive, controllers to receive their signals, interpret the readings and send the data to the cloud. While our LevelEyeTM Tank Level Monitoring Program can utilize any level-sensing device with a 4-20mA output, our standard program utilizes differential pressure transmitters. This eliminates the challenges encountered with ultrasonic level sensing and provides a more universal and accurate solution. There are 4 standard sensor configurations available to help meet most all chemical compatibility concerns. The information for these standard options is contained below.